The centres of our range of miscellaneous rosettes is based on our 57mm badges, which means that instead of the standard cardboard centre that is foil printed, we have the option to produce a ‘badge-like’ centre that can be printed in full colour, which gives a greater impact to the badge. 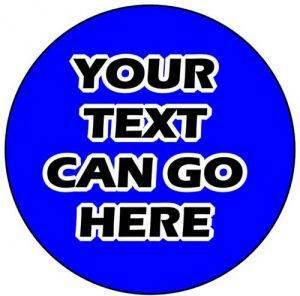 This also means that if required these rosette centres can have a photograph or company logo added. In addition, because our process does not require us to produce a foil block, we can produce literally one-offs. Once you have decided on the centre for the rosette then you just need to decide on the style of the rosette. Just choose the number of layers of ribbon and then the colours of the individual layers and the tails. 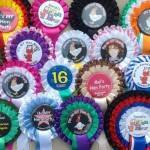 For extra personalisation you can also have the tails of the rosettes printed with your text of choice. 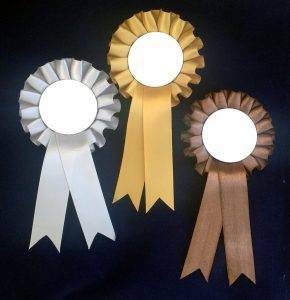 Our rosettes are all produced on demand by us, and made from top quality box-plated ribbon. This style of pleat gives a very full, luxurious appearance to the rosette, making ideal for promotional events where you want a rosette that portrays quality.